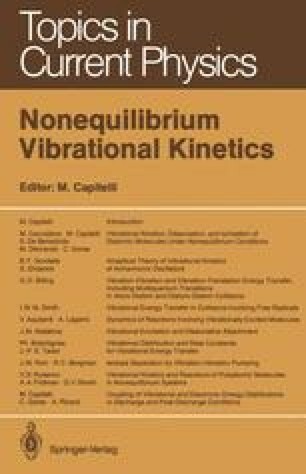 Vibration-to-vibration (V-V) energy exchange among the vibrational states of diatomic gases was first suggested as a means of isotope separation by Belenov et al. [9.1]. The application of such exchange processes to isotopically selective chemistry is a relatively straightforward extension of the physics of V-V exchange which was detailed in Chap.2. In a translationally cool, vibrationally excited diatomic gas mixture, V-V exchange collisions tend to overpopulate more closely spaced vibrational quantum states, and depopulate more widely spaced states, when compared with an equilibrium vibrational population distribution. For example, we have seen that such exchange in a single-species diatomic gas with anharmonic vibrational states creates a relative overpopulation of the higher-energy, more anharmonic states, which are more closely spaced. Similarly, in a binary mixture of oscillators, the lower-frequency oscillator, whose vibrational levels are more closely spaced, is preferentially populated by V-V exchange.